Okinawans vs. Adventists - Is it the Low Calories or Vegetarian Diet? I know there are a couple Dr.. Greger detractors on the forum, but he's got a new video talking about the diets and lifestyles of the long-lived Okinawans and vegetarian Adventists that I think people will find interesting.. He mentions that both groups eat a mostly plant-based diet.. He cites , which found that the vegetarian Adventists who also practiced a healthy lifestyle had average lifespans of 87 (men) and 90 (women).. That's 10-14 years longer than the general population, and even longer than the traditional Okinawans (77.6 for men and 86.0 for women). For those who don't like to watch videos, I've included the transcript at the bottom, along with all his references. His claim may be true, but its a big stretch to try to argue it from a comparison between the Okinawans and the vegetarian Adventists, to say nothing of attributing the (small) difference to the 98% vs..100% meat-free diet. There are plenty of other differences between the two groups that could explain they longevity difference besides the (perhaps) tiny bit more meat eaten by the Okinawans relative to the vegetarian Adventists - things like access to healthcare. High physical activity [> 15min 3x / week vigorous exercise], frequent consumption of nuts [>5 times/wk], vegetarian status [eating meat less than once per month], and medium body mass index [not specified, but presumably 22.5 - 25.0] each result in an approximate 1.5- to 2.5-years gain in life expectancy compared with the corresponding high-risk values [high risk for BMI wasn't specified, but was presumably > 25.0]. The sum of these independent effects (9.7 years in men and 10.4 years in women) is similar to those predicted in subjects who have contrasting values for all variables simultaneously. Having a medium BMI (vs. low or high) provides a longevity advantage. First BMI. The fact that having a medium BMI was better than a low BMI in this Adventist study, while having low BMI was better than medium BMI in this other Adventist Study  discussed a couple days ago in this post can best be explained by the fact that this study followed subjects for only 12 years, and excluded only the first 4 years of mortality data in an attempt to eliminate the confounding effects of pre-existing conditions. As we saw from , the lingering effects of pre-existing conditions (esp. respiratory problems and a prior history of smoking) have an impact on both BMI and mortality for much longer than 4 years. So I think it's safe to say that this study's conclusion that a medium BMI is better than a low BMI should be taken with a big grain of salt in light of the better evidence of the opposite on another group of Adventists in . Regarding the extra 1.5-2.5 years gain from being vegetarian vs. eating meat more often than once per week. Consider what the following graph from  shows us. The first bar shows life expectancy when all variables take medium-risk values. Then passing from left to right through the figures, additional variables are also set at either high- or low-risk values, those variables to the right of a particular bar being still at medium-risk values. In the final contrast, when all variables are at either low- or high-risk values, the differences in the expected ages at death are 10.8 years (men) and 9.8 years (women). So for men who are in the "medium risk" category for all these health factors, their average lifespan was 85.1 years (first, white bar on left). HR for all-cause mortality in vegans was 0.85 (95% CI, 0.73-1.01); in lacto-ovo-vegetarians, 0.91 (95% CI, 0.82-1.00); in pesco-vegetarians, 0.81 (95% CI, 0.69-0.94); and in semi-vegetarians, 0.92 (95% CI, 0.75-1.13) compared with nonvegetarians. So as much as it pains me to say it , and contra what Dr. Greger suggests, being a strict vegetarian, as opposed to eating meat (esp. fish) occasionally like the Okinawans, doesn't appear likely to be responsible for much of the lifespan advantage enjoyed by the Adventists relative to the Okinawans, which is substantial for men (average of Adventists man with best diet/lifestyle = 87.0 years, average Okinawan man = 77.6 years). 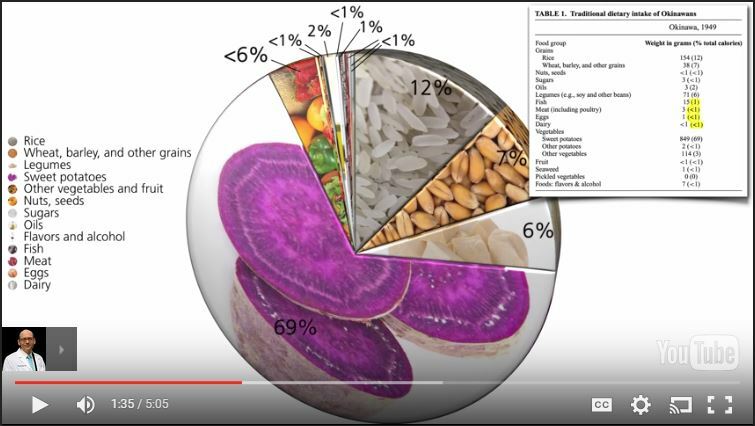 The dietary guidelines recommend that we try to choose meals or snacks that are high in nutrients but lower in calories to reduce the risk of chronic disease.. By this measure, the healthiest foods on the planet, the most nutrient dense, are vegetables, containing the most nutrient bang for our caloric buck.. So, what would happen if a population centered their diet around vegetables? They might end up having among the longest lives. Of course, any time you hear about long-living populations, you have to make sure it’s validated, as it may be hard to find birth certificates from the 1890’s.. But validation studies suggest that, indeed, they really do live that long. The traditional diet in Okinawa is based on vegetables, beans, and other plants.. I’m used to seeing the Okinawan diet represented like this, the base being vegetables, beans, and grains, but a substantial contribution from fish and other meat, but a more accurate representation would be this - if you look at their actual dietary intake.. We know what they were eating from the U.S.. National Archives, because the U.S.. military ran Okinawa until it was given back to Japan in 1972, and if you look at the traditional diets of more than 2000 Okinawans, this is how it breaks down. Less than 1% of their diet was fish; less than 1% of their diet was meat, and same with dairy and eggs, so it was more than 96% plant-based, and more than 90% whole food plant based—very few processed foods either.. And, not just whole food plant-based, but most of their diet was vegetables, and one vegetable in particular, sweet potatoes.. The Okinawan diet was centered around sweet potatoes—how delicious is that? Could have been bitter gourd, or soursop—but no, sweet potatoes, yum. So, 90 plus percent whole food plant-based makes it a highly anti-inflammatory diet, makes it a highly antioxidant diet.. If you measure the level of oxidized fat within their system, there is compelling evidence of less free radical damage.. Maybe they just genetically have better antioxidant enzymes or something? No, their antioxidant enzyme activity is the same; it’s all the extra antioxidants that they’re getting from their diet that may be making the difference—most of their diet is vegetables! So, 6 to 12 times fewer heart disease deaths than the U.S.—you can see they ran out of room for the graph for our death rate, two to three times fewer colon cancer deaths, seven times fewer prostate cancer deaths, and five and a half times lower risk of dying from breast cancer. Some of this protection may be because they were only eating about 1800 calories a day, but they were actually eating a greater mass of food, but the whole plant foods are just calorically dilute.. There’s also a cultural norm not to stuff oneself. The plant-based nature of the diet may trump the caloric restriction, though, since the one population that lives even longer than the Okinawa Japanese don’t just eat a 98% meat-free diet, they eat 100% meat-free.. The Adventist vegetarians in California, with perhaps the highest life expectancy of any formally described population. Adventist vegetarian men and women live to be about 83 and 86, comparable to Okinawan women, but better than Okinawan men.. The best of the best were Adventist vegetarians who had healthy lifestyles too, like being exercising nonsmokers, 87 and nearly 90, on average.. That’s like 10 to 14 years longer than the general population.. Ten to 14 extra years on this Earth from simple lifestyle choices.. And, this is happening now, in modern times, whereas Okinawan longevity is now a thing of the past.. Okinawa now hosts more than a dozen KFCs . Their saturated fat tripled.. They went from eating essentially no cholesterol to a few Big Macs' worth, tripled their sodium, and are now just as potassium deficient as Americans, getting less than half of the recommended minimum daily intake of 4700 mg a day.. In two generations, Okinawans have gone from the leanest Japanese to the fattest.. As a consequence, there has been a resurgence of interest from public health professionals in getting Okinawans to eat the Okinawan diet, too. D C Willcox, G Scapagnini, B J Willcox.. Healthy aging diets other than the Mediterranean: a focus on the Okinawan diet.. Mech Ageing Dev.. 2014 Mar-Apr;136-137:148-62. A Drewnowski, J Hill, B Wansink, R Murray, C Diekman.. Achieve Better Health With Nutrient-Rich Foods.. Nutrition Today: January/February 2012 - Volume 47 - Issue 1 - p 23–29. D C Willcox, B J Willcox, H Todoriki, M Suzuki.. The Okinawan diet: health implications of a low-calorie, nutrient-dense, antioxidant-rich dietary pattern low in glycemic load.. J Am Coll Nutr.. 2009 Aug;28. S Davinelli, D C Willcox, G Scapagnini.. Extending healthy ageing: nutrient sensitive pathway and centenarian population.. Immun Ageing.. 2012 Apr 23;9:9. B J Willcox, D C Willcox.. Caloric restriction, caloric restriction mimetics, and healthy aging in Okinawa: controversies and clinical implications.. Curr Opin Clin Nutr Metab Care.. 2014 Jan;17(1):51-8. M Poulain.. Exceptional Longevity in Okinawa:: A Plea for In-depth Validation..Demographic Research;Jul-Dec2011, Vol.. 25, p245. N S Gavrilova, L A Gavrilov.. Comments on Dietary Restriction, Okinawa Diet and Longevity.. Gerontology.. 2012 Apr; 58(3): 221–223. B J Willcox, D C Willcox, H Todoriki, A Fujiyoshi, K Yano, Q He, J D Curb, M Suzuki..Caloric restriction, the traditional Okinawan diet, and healthy aging: the diet of the world's longest-lived people and its potential impact on morbidity and life span.. Ann N Y Acad Sci.. 2007 Oct;1114:434-55. D C Willcox, B J Willcox, H Todoriki, J D Curb, M Suzuki.. Caloric restriction and human longevity: what can we learn from the Okinawans? Biogerontology.. 2006 Jun;7(3):173-7. G E Fraser, D J Shavlik.. Ten years of life: Is it a matter of choice? Arch Intern Med..2001 Jul 9;161(13):1645-52. D C Willcox, B J Willcox, Q He, N C Wang, M Suzuki.. They really are that old: a validation study of centenarian prevalence in Okinawa.. J Gerontol A Biol Sci Med Sci.. 2008 Apr;63(4):338-49. M Suzuki, B J Wilcox, C D Wilcox.. Implications from and for food cultures for cardiovascular disease: longevity.. Asia Pac J Clin Nutr.. 2001;10(2):165-71. M Suzuki, D C Wilcox, M W Rosenbaum, B J Willcox.. Oxidative stress and longevity in okinawa: an investigation of blood lipid peroxidation and tocopherol in okinawan centenarians.. Curr Gerontol Geriatr Res.. 2010;2010:380460. Arch Intern Med. 2001 Jul 9;161(13):1645-52.
expectancy, although there is little direct evidence. questionnaire provided dietary and other exposure information at study baseline. at either medium- or high-risk levels. beneficial effects of more optimal behaviors. JAMA Intern Med.. 2013 Jul 8;173(13):1230-8.. doi: 10.1001/jamainternmed.2013.6473. (1)School of Public Health, Loma Linda University, Loma Linda, CA 92350, USA. JAMA Intern Med.. 2014 Jan;174(1):168-9. JAMA Intern Med.. 2014 Jan;174(1):169. JAMA Intern Med.. 2013 Jul 8;173(13):1238-9. Dtsch Med Wochenschr.. 2013 Sep;138(39):1930.
with reduced mortality, but the relationship is not well established. regression, controlling for important demographic and lifestyle confounders. SETTING: Adventist Health Study 2 (AHS-2), a large North American cohort. semi-vegetarian, pesco-vegetarian, lacto-ovo-vegetarian, and vegan. from the National Death Index. significant than were those in women. carefully by those offering dietary guidance. Int J Obes Relat Metab Disord.. 1998 Jun;22(6):544-8.
among men from the Adventist Mortality Study. (1)Center for Health Research, Loma Linda University, CA 92350, USA. surveillance during a 26y study period (1960-1985). analyses to men with no baseline history of respiratory disease. between BMI and all-cause mortality, reported in the original study. The all-cause mortality hazard ratio you're qoting above is derived from combining the data from both male and female Adventists, but there may be some value in examining these issues with gender taken into account. According to what you've written here, it is the vegetarian Adventist males who are the real comparative standouts - outliving the male Okinawans by almost 10 years, whilst the female Adventists are "only" managing an extra 4 years over the female Okinawans. "Vegans had significantly reduced risk in both sexes combined for other mortality (HR, 0.74; 95% CI, 0.56–0.99) and in men for all-cause mortality (0.72; 0.56–0.92), IHD mortality (0.45; 0.21–0.94), and CVD mortality (0.58;0.38–0.89)." Thanks Brett, table 4 shows you are correct - males gained from being vegans more than women did, particularly relative to heart disease. The only cause of death they trailed in relative to other vegetarians was "other", which probably means respiratory disease which as we've seen elsewhere may have been properly washed out if the exclusion and/or follo-up periods had been longer. But table 4 also shows even male vegans didn't REALLY beat male pesco-vegetarian, since their mortality rates were 0.72 and 0.73, respectively, relative to omnivores with virtually identical 95‰ confidence intervals. I haven't read the full transcript, so maybe this is already covered. But the 'Average Age at Death, y' chart is also striking in that, assuming I understand it, compared with all values at medium risk, the benefit of all values at low risk seems to be almost trivial. But the effect of moving from medium risk to high risk seems to be comparatively huge - nine years lost versus two years gained. shows that selecting all "middle risk" diet & lifestyle choices results in an average lifespan of 85.1 years. Selecting all "low risk" diet and lifestyle choices results in two years more lifespan (87.0). Selecting all "high risk" diet and lifestyle choices (including past smoking), results in a lifespan 9 years shorter (76.2). But note, even the "high risk" behaviors aren't all that bad - these are Seventh Day Adventists after all . In fact, making what for the Adventists are the "high risk" lifestyle choices basically turns them into about the equivalent of an average Californian white, non-hispanic man from a life expectancy perspective, which itself is ahead of men from most other racial and regional groups in the US. The life expectancy data quoted by Dr Gregor is not looking at the cohort of age 65 + but everyone. We know that the life expectancy of Okinawans has decreased since the introduction of Western foods. However, if you look at the oldest group who are still eating a mostly traditional diet, their average life expectancy is age 89 for women and 83 for men. If you further refine that to those who we know definitely are eating the traditional diet it is probably in line with the 7th day Adventists. The older cohort of Okinawans (aged 65-plus) is remarkable in many ways. and the longest survival in Japan, the country with world’s longest-lived population. I've been pondering recently the life expectancy issue. there appears to be one factor which is not considered in the actuarial tables yet it is fundamental for all practical purposes. I'm going maybe to open a new thread on that, but life expectancy= average lifespan of a population for a newborn at time t = ti, disregards state of health of the individual. LE is presently 79 years in America. So, those who have been borne in 2016-2017, will live on the average (about 50%) 79 years. The 50% which is going to live longer, we don't know in which conditions they are going to live. In a geriatric ward? Or like the old-style Okinawans, tending their garden? So, I'd rather be interested into LE conditioned to self-sufficiency. Official tables disregard this so they are of little value to us. My father is 93 so well beyond the 50th percentile, but is presently in a geriatric ward and I would prefer death to that life condition. The recent increase in LE is probably due significantly to medical interventions which keep people in life but disabled. It turns out that there are statisticians studying life expectancy in relation to morbidity levels. This should obviously be our main outlook, I still have to read the article (alPAter, maybe you already listed this in your reviews). CENTENARIANS AS A 21st CENTURY HEALTHY AGING MODEL: A LEGACY OF HUMANITY AND THE NEED FOR A WORLD-WIDE CONSORTIUM (WWCC100+). In the Okinawa Centenarian Study a high prevalence and a continuous increase of centenarians in this island emerges, in comparison to other relatively long-lived countries. In 1975 there were less than 30 centenarians while at present (2016) the number was close to 1000. According to the Authors, this phenomenon is due to an improvement of life expectancy advantage by generation, an increase that was most evident in women (in Okinawa 87% of centenarians are females) (Willcox et al.). The demographic aspects are also described in the paper dedicated to longevity in Japan (Arai et al.). In this paper, particular attention was devoted to summarizing the peculiar characteristics and phenotypes of semi-supercentenarians (105+) and supercentenarians (110+), while stressing their heterogeneity. These subjects, and particularly supercentenarians, are characterized by the marked postponement of age-related debilitation and the retention of physical independence for an extraordinarily long period. A major characteristic of centenarians is the fact that they avoided or postponed the onset of major age-related diseases, including dementia, and that some of them maintain a good cognitive status. Recently, Ismail and co-authors have validated data regarding the compression of morbidity and the delay of the onset of major age-related diseases for cancer, cardiovascular disease, diabetes mellitus, hypertension, and osteoporosis, in two large populations of exceptional long-living subjects (Ismail et al., 2016). Moreover, the authors demonstrated that this finding could be generalised to ethnically varied longevity cohorts. Recently, it was reported that centenarians belonging to a large cohort of predominantly male community-dwelling elderly veterans, showed slower incidence rates of chronic diseases, such as stroke, atrial fibrillation, heart failure, chronic obstructive pulmonary disease, malignancy diabetes mellitus than younger subjects (Kheirbek et al., 2017). Thus, centenarians can be assumed as the most informative human model of healthy ageing where the influence of diseases and comorbidities is minimized. This model allows the identification of the fundamental biological mechanisms involved in and responsible for human longevity and healthy ageing. Centenarians lived without major diseases until a very advanced age, when most of the members of the same demographic cohort underwent a major disease or died. In particular, those who still maintain unimpaired cognitive ability, offer the unique possibility to identify protective genetic and non-genetic factors towards severe cognitive decline and dementia and/or to assess whether the classical risk factors for dementia change sign and/or to continue to exert their role even at advanced/extreme age. [...] it is clear that we are far from understanding such a huge diversity of centenarians related to their different birth cohorts, ethnicity, and worldwide cultural habits (lifestyle, nutrition, socio-economic status). We are under the impression that we have scratched the surface and that the quest for understanding the reasons why centenarians are centenarians are still largely unknown. These considerations are particularly important regarding a large number of nations, including demographic giants like India, where the study of centenarians are scarce. Thus, a global effort is urgently needed, and the Editors and all the scientists who authored the papers included in this special issue take this opportunity to launch the idea of a Worldwide Centenarian Consortium (whose acronym could be WWC100+) to adequately address the complexity of extreme longevity. We could all profit from the experience of ongoing initiatives such as the International Centenarian Consortium − dementia (ICC-dementia) to pave the way to a widespread approach to human longevity and healthy aging (Brodaty et al., 2016). Of course, Aubrey de Grey and like-minded purveyors of engineered biological immortality reject and abhor the idea of "healthy aging" and "compression of morbidity". Exactly. You could build a database of all confirmed centenarians+ and all the lifestyle & diet characteristics on the one hand and a random matched cohort on the other and try to see if there are any factors that the centenarian+ all share (lifestyle & diet) that the random matched cohort does not. If there are such characteristcs, then one may point to those aspects of lifestyle & diet. But I bet that there are virtually no such lifestyle & diet factors, maybe other than extreme alcoholism and massive lifelong smoking and the like. The "diversity" of centenarians is such, that there really are no common lifestyle & diet factors. Which means, that yet again, it's down to genes, genes, genes and a lucky environment where a particular epigenetic profile gets triggered. Really, it just says - we don't have much control over our lifespan. If your genes say your potential lifespan is 85 years old max, then if you do all you can, you might reach your full potential (85), but that's that. And statistically, probably few of us have supercentenarian potential - and no amount of lifestyle & diet interventions will alter that. Again, our only hope is in pharma and gene manipulation - lifestyle & diet can only bring us to full potential, which for most of us is measly. @Tombavoider: your outlook is not optimistic, maybe epigenetics can be a most important factor than genotype itself. Maybe. It would be interesting to see a scientific comparative study as you say. This is the CDC definition of Healthy life expectancy (HLE). As far as I'm concerned, HLE is the significant parameter, rather than mere LE. There are tables of LE and HLE, interestingly, HLE seems to be 5 years less than LE at 65. These are average figures of course. HLE at birth (which is: average healthy lifespan) in the USA in 2015 was 69 years (both sexes). In Sierra Leone it was 44 years. The numbers are significantly lower than the average life expectancy regardless of health (about 10 years lower). In Sierra Leone presently only about 50% of people make it to 44 in reasonable healthy conditions. In the same site, there is an interesting collection of data per nation. I think that the results of studies on vegetarians are not really allowing any conclusions about vegans. And vegan alone also is not that conclusive when it comes to wfpb. Defining a diet by what it is lacking makes very little sense to me. Knowing what exactly it contains of is what really allows to get useful results when comparing it to other diets.